A few months back, my husband was on the lookout for a new (to him) reading chair. 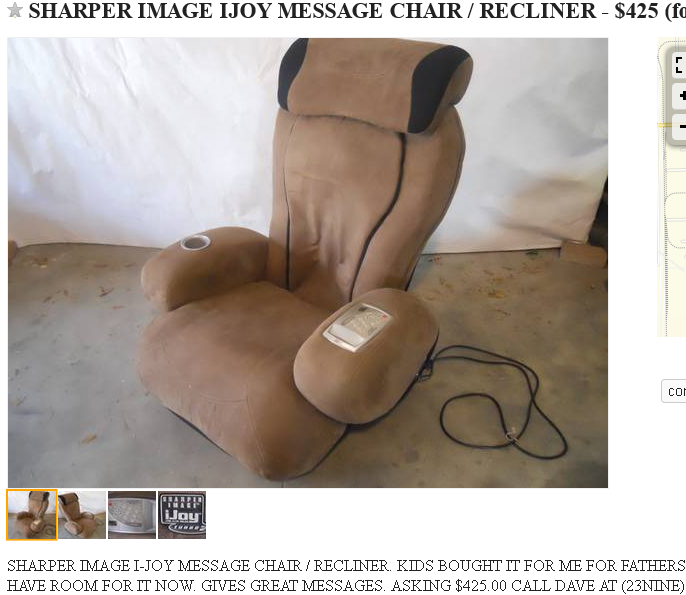 So he took to Craigslist to find a gently-used leather recliner. Since he’s totally blind, he copied and pasted URLs to ones he thought fit the bill in an email to me, and I perused the images and called potential sellers. I wouldn’t expect the average Craigslist-er to understand the ins and outs of selling online, but some of these listings prove my point. When writing product descriptions, be accurate (not misleading), and use words that properly explain the product. There are millions of totally blind people surfing the web. There are tons of folk who surf text before images and video, and plenty of mobile users who opt to read information before loading media because it saves on bandwidth. More often than not, these people are power users. And you can bet they spend money like the rest of us. It was difficult explaining the chair to Joe, but we both agreed it wasn’t what he was looking for. Next was an iJoy Massage Chair. 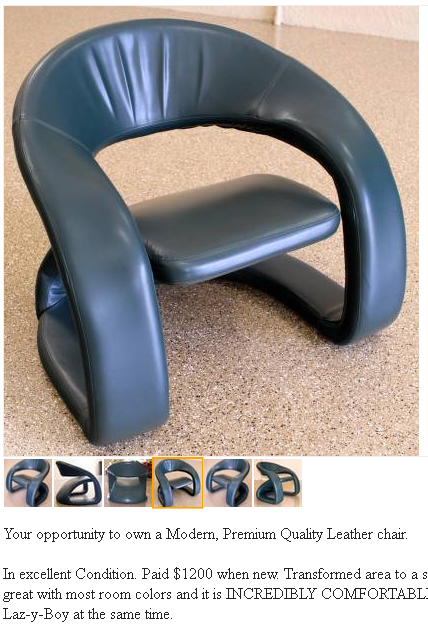 In the lister’s defense, even Sharper Images’ own site doesn’t make it clear up front that some of these are “floor” chairs. But since the iJoy also comes in a full-size, standard chair style, this is the perfect example of using images alone to describe a product (and that’s a no-no). It massages. It reclines. Where are the legs? Or, how about no description at all? How about just a blurry, 4-year-old photo with no details? Oh, except for the brand. Remember, there’s nothing wrong with too much information about a product, so long as it is easy to read and understand, and is accurate. We did find a chair that weekend. I failed to screenshot the listing, but it was very detailed and the seller wound up living just a few blocks away. The sellers even had a dog who was jumping all over the matching sofa (which was not for sale). I inspected it and figured if there were no marks on the couch, the chair should hold up to our dog as well. Within 20 minutes we’d bought the chair and loaded it onto the truck. I wonder how many listings Joe passed up because of non-descriptive titles. 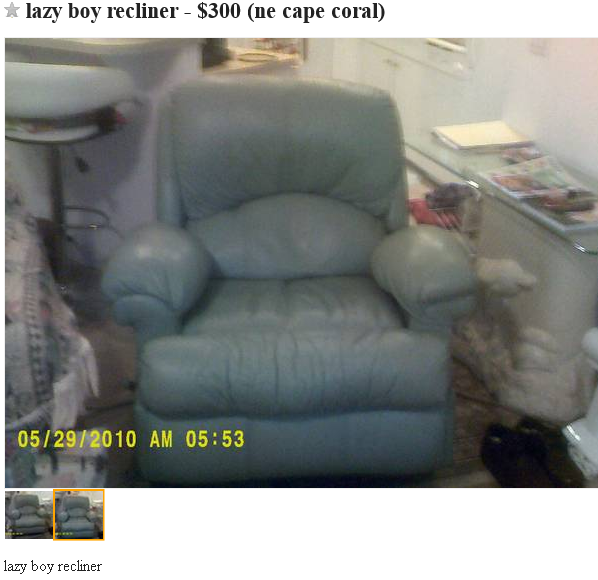 I wonder if his perfect chair was sitting on Craigslist for weeks, waiting for buyers like us. We’ll never know.